I guess I was having a bit of a Buddhist moment. I thought I’d do a bit of painting. No – not ART. (I think ART is too much about this world and the ego and the me me me.) Nothing wrong with that but the Dalai Lama hasn’t been a Turnover prize winner has he? So – I was blanching the walls. Here in Charente the walls are Blanc, maybe une rose claire or maybe a risque beige. The sun bounces off the pastels while cherubs sleep on my wall. Look – I’m a Tacky Romantic OK. The front face of the house had become a bit tatty and flaky. I started to clean and brush the stone. First I saw a panicking earwig disturbed from somewhere on the flagstones. Generations of them had lived in a certain universe. I mean A UNIVERSE OF CERTAINTY. Suddenly a Mr Brico broom entered their cosmos. As I worked I caught a cob web in my paint roller. A spider reeled out a life saving silk of utter magical strength and mystery…..and landed in my tray of paint. Certainty destroyed again- scales of Time and Dimension overturned and brutalised. We are no less fragile but our scale of Time and power is different. World markets, the circus of greed, the preaching hedonists ( had to put myself in somewhere) will be swept away. All is relative and will change. I work on ideas of acceptance, wondering if I can have a glass of wine before 5 O’ clock. While I was painting several folk stopped for a chat. As I was drinking a cup of tea, a neighbour remarked that I always had a cup of tea in my hand. “This is how we won the Empire, the World War and the CUP in 1966.” I replied, “What do you do in France?” The neighbour thought for a moment – “We have longer lunches and then it is time for aperitif.” He replied. I thought he was joking – until he came back with a glass of Pineau. Well, it was after 5. Outside as I write a pigeon is giving it some real wellie. Wherever you are in the world pigeons and cockerels sound the same….yes a cockerel has just started up, probably to out-shout the bloody pigeon. BUT today I saw three butterflies. There has been a shortage and there still is no doubt. In the drought of butterflies a single one is a joy. The fragile motion of its paper thin defiant wings scribbled a poem against the blue sky that left me in tears. Emma thinx: To most living things, we are the Tsunami. 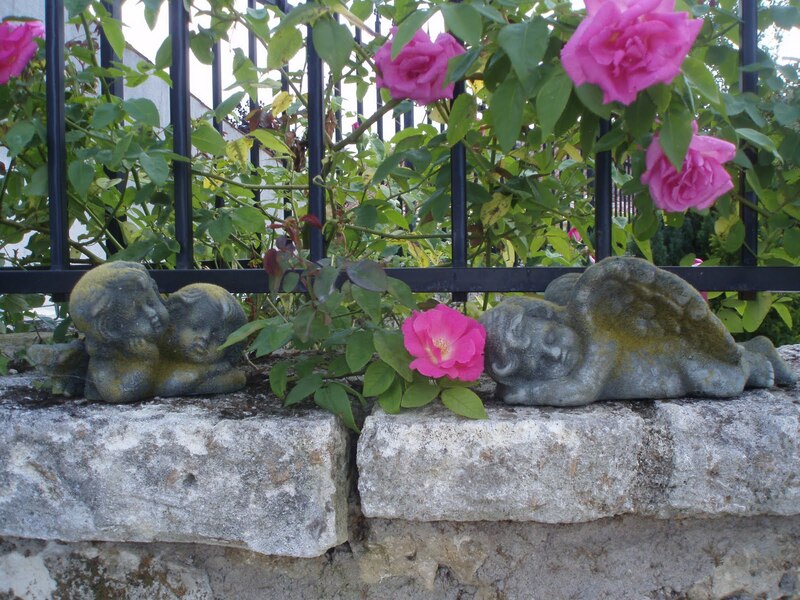 This entry was posted in Animals, Emma Calin, France, Philosophy, poetry, Seasons by emmacalin. Bookmark the permalink.